Chiyoko Fujiwara is an actress with a long and illustrious career spanning several decades. When two reporters travel to her secluded home in the mountains to interview her they are taken on a mesmerising journey through her past. She recounts her earliest experiences on screen and the chance encounter with a runaway political activist that was to prove a formative experience. While running away from the police this rebel artist is first protected, and later taken in by Chiyoko. He gives her a key, telling her to return it to him the next time they meet. This leads her into her acting career and provides a fixed point throughout her life as she strives to be reunited with him. Written and directed by Satoshi Kon, Millenium Actress features the same fourth-wall breaking and subjective approach that characterise his films Perfect Blue and Paprika. Similarly to Mima’s journey in Perfect Blue, Chiyoko’s story is told not only through her interview, but through a series of flashbacks which are increasingly interrupted by the journalists themselves, who appear to be recording the scenes in the past, or even appear as characters in the films. This is a novel way to tell the story and provides a great amount of humour as well as pulling the audience along forcefully with the narrative. It is one of the triumphs of the film that despite being essentially a sequence of flashbacks, it maintains a real sense of tension during the action sequences, in part by wrong-footing the viewer and blurring the line between drama and reality. The story itself is fairly straightforward and focused on Chiyoko with a fascination that is fitting for her role as a movie starlet. We are forced to concentrate due to the shifting nature of the narrative, never sure what is real or part of a film. The central love story and the mystery surrounding the key provide a rigid framework around which ideas of identity, the power of art and cinema, fame and celebrity are woven. The score is emotional and heightens the drama. As with other works by Satoshi Kon there is a great attention to detail and it is interesting to see the various periods depicted as Chiyoko works on films through the decades. 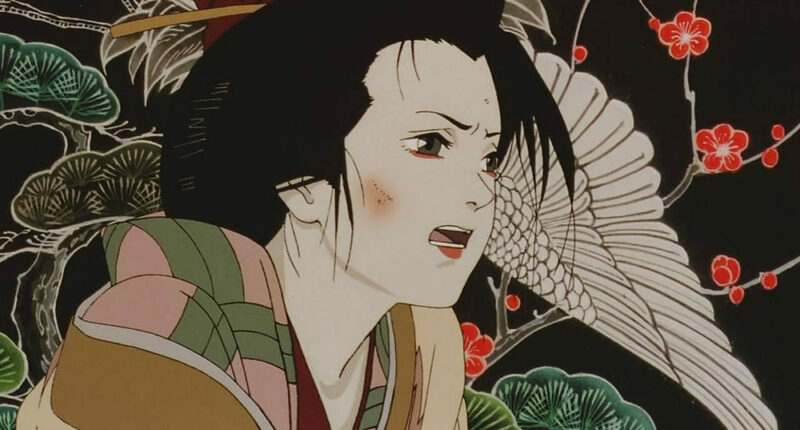 Millennium Actress is a fascinating journey through this character’s subjective reality. We are never quite sure what is happening, that heightens the importance of her emotional response to the world. It is made clear throughout that the line between film and reality, in the impact they have on one another, is blurred. This means the only thing that characters can rely on are their own feelings. The film also touches on the importance of finding this goal in leading a successful life. Chiyoko is told by her mother not to become an actress, and to settle down and start a family. This represents the traditional view of many. But it is clear that Chiyoko’s life and importance to others as a movie star vindicates her independence of thought and desire to pursue her own career and interests.